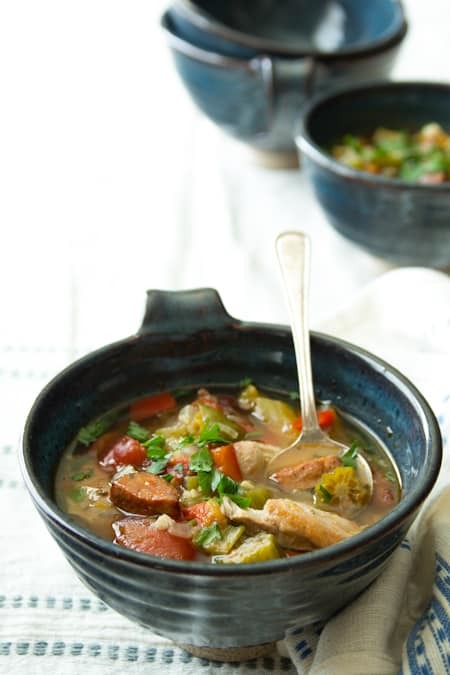 This homemade slow cooker gumbo features chicken, Andouille sausage, okra, and lots of fresh veggies! It’s the perfect winter weeknight dinner. After listening to the New Orleans edition of the Splendid Table last weekend, I have had gumbo on the brain. Since jetting off to New Orleans wasn’t really a likely addition to my weekly to-do list, I knew there was really only one way to get my fix. And it just so happens that the star produce in gumbo is in season right now: peppers, tomatoes, onions, garlic and, of course, okra. I have been pretty swamped with work lately. This week I got to help lead a healthy seasonal recipe development workshop for a recipe book project for school lunch programs! How cool is that? So I wanted to make this chicken gumbo a slow cooker recipe. That way I could do all the prep ahead, set it up in the morning and not have to worry about walking into the house and magically whipping up dinner. If you grew up outside of the southern United States, it’s very likely that you’ve never tried gumbo before. Gumbo is a thick soup that’s most commonly eaten in Southern Louisiana (it’s on almost every menu in New Orleans). 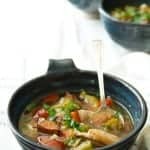 Gumbo can be made with whatever meat you have on hand, but seafood gumbo, sausage gumbo, and chicken gumbo are the most popular takes on this dish. 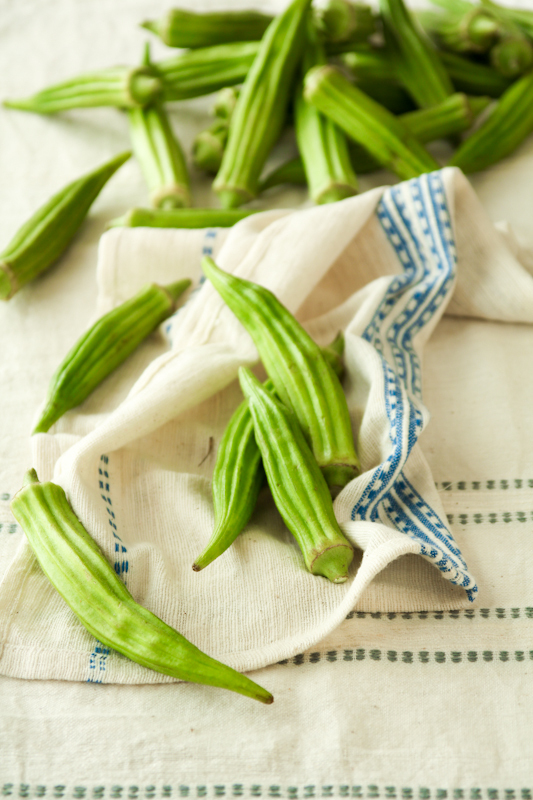 It should also be noted that gumbo is almost always made with okra and some kind of thickening agent, like filé powder or a roux. 1. Prep and peel the fresh tomatoes — Peeling fresh tomatoes is a fairly straightforward process. You need to score the tomatoes with a knife, then briefly submerge them in a pot of boiling water. Transfer them immediately to an ice bath, then slip the skin off the cooled tomatoes. 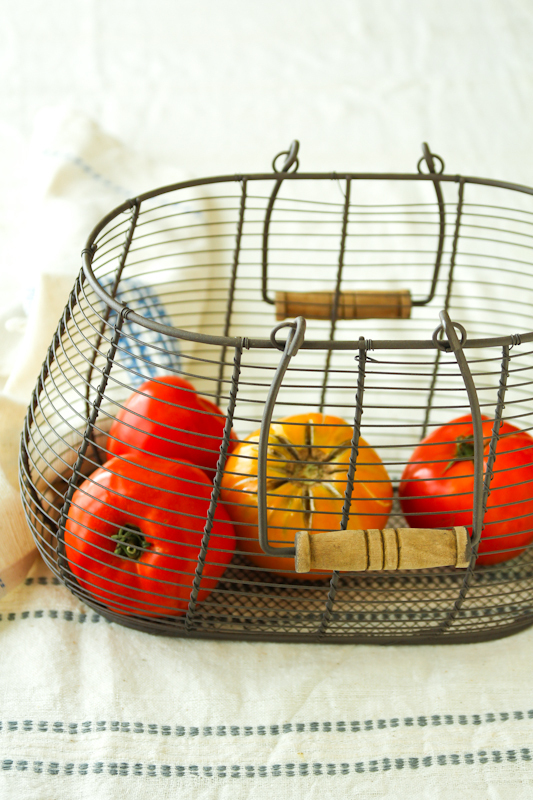 Once the fresh tomatoes are peeled, you can seed and roughly chop them. 2. Prep the rest of the ingredients for the slow cooker — You first need to sear the chicken in a skillet before adding it to the slow cooker along with the broth and some salt. Then saute the veggies and the sausage (if using) until the onions are nicely browned. Stir in the herbs and cook a little longer, just until they begin kicking off some scent. Transfer the contents of the skillet to the slow cooker, and then add in the rest of the ingredients. 3. Slow cook the gumbo — This slow cooker chicken gumbo needs to cook on low for 8 hours. Once the timer goes off, you can stir in the filé and serve the gumbo! The tomatoes — I used fresh tomatoes because they are abundantly available and in season right now, and they are lower in sodium than canned tomatoes. 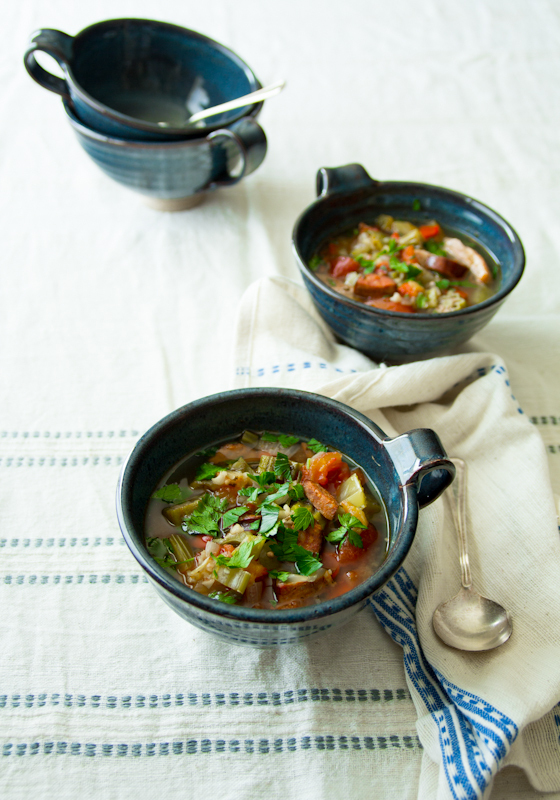 Also, I love the fresh juicy chunks of tomatoes in this hearty soup. It does take a bit of work to peel and seed them, but I think the results are worth it. If you don’t have time to deal with peeling and seeding fresh tomatoes, feel free to substitute roughly chopped canned whole tomatoes. You’ll need about 6 cups. Just be sure to drop the added salt down. The okra — Right now okra is available at Farmers Markets and in good grocery stores. I like to buy a little extra, so when I come across a pithy one, I can discard it. If you can’t find it fresh, frozen is fine. The Andouille — Andouille can pack some heat. So if your family would prefer a more mild soup, use kielbasa instead and seed (or omit) the jalapeno. The gumbo filé — Gumbo filé is a spice used in Creole cooking made from sassafras. It has a piney flavor and is typically used to thicken Gumbos. I found it in the bulk spice section of our local food co-op. If you cannot find it, the soup will be a touch less thick, but still delicious. Combine broth and ¾ teaspoon salt in a large slow cooker and turn to low heat for 8 hours. Meanwhile, sprinkle ¼ teaspoon salt over the chicken. Heat oil in a large skillet over medium-high heat. Add chicken and cook until browned 2 to 3 minutes per side. Transfer the chicken to the slow cooker. Add onion, garlic, jalapeno, if using, and Andouille or kielbasa to the skillet and cook, stirring often until the onions are browned and softened, 7 to 10 minutes. Stir in sage, thyme and nutmeg and cook, stirring until fragrant, 30 to 90 seconds. Transfer the onion mixture to the slow cooker. Add the tomatoes, reserved tomato juice from the bowl and tomato paste to the skillet and bring to a boil, scraping up any browned bits from the bottom. Remove from the heat and transfer to the slow cooker. Add rosemary sprig, celery, bell peppers, okra and rice to the slow cooker and cover. Cook until the timer goes off and turn off heat if necessary. Discard rosemary sprig and stir in gumbo file. Do not continue to cook with file. Garnish with parsley. mmm…this looks super comforting and flavourful! Love your soup cups too. Thank you Angie! They were an engagement gift many moons ago. Happy cooking to you. This chicken dish looks delicious – saw it on FoodGawker! I just made slow cooker chicken dish too, and posted it on my blog. Thank you so much for coming by to check it out Julia. That is great that this one strikes a chord with you Ashley. Thank you so much. I too love soup on a cool fall day. AWESOME AWESOME AWESOME!!! recipe thank you sooo much for sharing! Many years ago I used to work in a Cajun House. And we used to make this Gumbo, that was something else!!! I’ll definitely spread the word on the recipe! Thanks once again for sharing! Ben, glad this sounds good to you. And thank you so much for sharing. Cheers! Those bowls are beautiful! Do you mind sharing where you got them? Hi Jennifer, so sorry that I am just now seeing this. These bowls are from the summer of 2002, and were an engagement gift. The artist who made them sells ceramics at the Burlington Farmers’ Market here in Vermont. I think he still has a stand there all these years later, even though the Farmers’ Market is three times the size it was back then. This is NOT gumbo! You don’t even have flour on the ingredient list for your roux. Anyone who knows real gumbo will tell you this recipe is more like a soup. I make gumbo all of the time and, yes, I usually use a roux; however, I also know that okra and gumbo file will thicken just about anything sans a roux. This recipe sounds DELICIOUS roux or no roux! Yes, I too know gumbo file and okra will thicken a gumbo but just because you add those ingredients doesn’t mean it’s a gumbo. This recipient does indeed sound delicious, I am just saying I believe it sounds more like a soup. This is absolutely gumbo! It’s called Creole Gumbo as opposed to the Cajun Gumbo made with a roux like you are talking about. I was born, raised, and still living in New Orleans. Though my Maw-Maw was Cajun, she always made Creole Gumbo like this recipe, and it was delicious! Hi Lori, glad you approve. That is great to hear! And I love the name “Maw-Maw” I can hear it now! As I am sure this is good, this is not gumbo. I am not sure where you learned this recipe, but you can’t make gumbo without a roux, gumbo has neither tomatoes nor jalapenos in it. If you are going to make a Cajun dish, get the recipe from someone who truly knows how to make gumbo. If you do not want to make it as it should be, don’t call it gumbo. 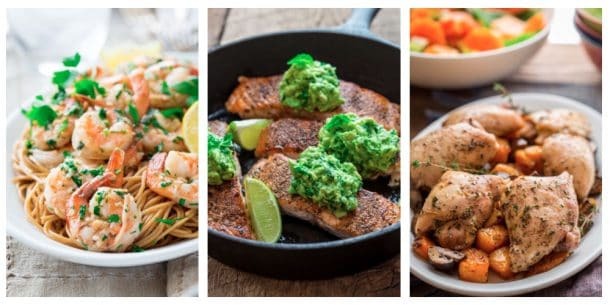 Jumping on the Cajun “bandwagon” with dishes like this that are not Cajun does the Cajun culture no good and fools people into thinking they know what Cajun food is. Like I said, this may be a very good SOUP, but it is not gumbo. 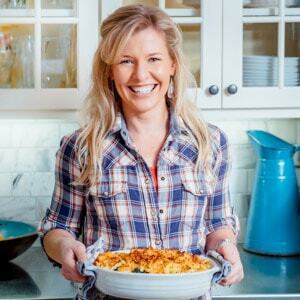 I am a true Cajun and cook who has lived in the Cajun areas (which is not New Orleans by the way) for my whole life.